Invite your imagination inside the Vampire Lounge for a tasting flight of red or white wine created and designed by Vampire Vineyards. Rumored to be owned by a circle of vampires, this cool seductive tasting room is the first of its kind. 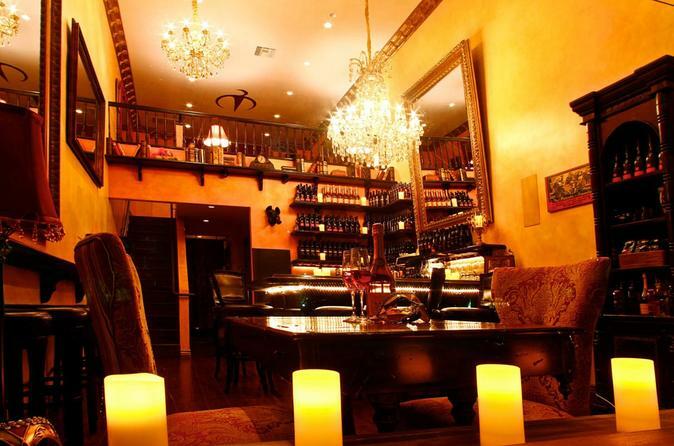 This gothic chic wine lounge is a secret escape in the heart of Beverly Hills. While sipping on your wine of choice, you can also purchase tempting bittersweet chocolates, espresso, and elegant fine teas. If you'd like to sip a little bit more, enjoy $10 off your preferred bottle of wine! Great value for the money at Beverly Hills upscale Vampire Wine Lounge. We offer a great discount for wine tasting. Also included is $10 off any bottle of wine. We are open seven days a week. Once purchased just show up anytime during our available hours. We have bands, DJ's, magicians, and great entertainment. Also available are small bites such as cheese plates, meat plates and dips. Also hang around for coffee and cake. Great for birthday parties or private events. At Vampire Lounge & Tasting Room, visitors sip vampire-themed pours such as the Chateau de Vampire Rouseanne and Dracula Syrah from the bar's namesake winery, Vampire Vineyards. Its moniker originated from its ties to Transylvania back in the '90s, but even now that it's a purely Napa Valley operation, the name still fits. The Vampire Lounge menu also features imported sparkling wines from Je T'aime, as well as bittersweet chocolates, Vampire espresso, and fine teas. The Vampire Lounge has become an oasis for the entertainment business to enjoy a quiet bottle of wine. Vampire Vineyard's wines have sponsored movie premiers such as George Clooney, Quentin Tarantino’s Dusk Til Dawn; Wesley Snipes’ Blade and Blade Trinity; Kate Beckinsale’s Underworld and Underworld Evolution; Tim Burton’s Dark Shadows starring Johnny Depp and Michelle Pfeifer, and most recently this year the hit movie Vampire Academy.